He was a chess prodigy and holds the record for the youngest grandmaster in history, achieving the title at the age of twelve years and seven months. 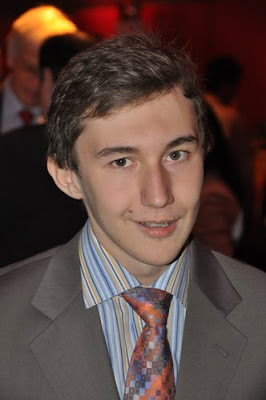 Born on January 12th, 1990 in Simferopol, Ukraine, but on July 25th 2009, Karjakin adopted Russian citizenship. In the January FIDE rating list, he appeared as a Russian and has been living in Moscow lately. Karjakin learned to play chess when he was five years old and became an IM at age eleven. In 2001, he won the World Chess U12 championship. Sergey’s name became known when in 2002, before he was 12 years old, and before he made his GM title, when Ponomariov appointed him as his second for the FIDE world championships match with Ivanchuk. At age fourteen he defeated the reigning world champion, Vladimir Kramnik, during the 2004 Dortmund Sparkassen Chess Meeting, in a blitz game (ten minutes for the entire game, plus five seconds per move). Karjakin entered the world's top 100 in the April 2005 FIDE list, where he was number 64 in the world with an Elo rating of 2635. During the Chess World Cup 2007, which served as a qualification tournament for the World Chess Championship 2009, Karjakin reached the semi-finals, in which he lost to Alexei Shirov. On the January 2008 FIDE rating list, published just before Karjakin's eighteenth birthday, he passed for the first time the 2700 mark, often seen as the line that separates "elite" players from other grandmasters, with a new rating of 2732 and a world rank of 13. In the world cup in Khanty Mansisyk, December 2009, Karjakin made his way till the semi final games, but as it was in 2007, he was knocked out at this very point: this time he lost to Boris Gelfand from Israel: 0-2. And right at this moment, he is struggling to defend his title as the champion of the Group A of Corus Wijk aan Zee that he won in 2009. His current rating is 2720. A little about his personal life: On July 24th he married twenty-year-old Ukrainian WIM Kateryna Dolzhikova, rated 2272, at the Central Registry in Kiev. This was followed by a ceremony at the St. George Church in Kiev, with two dozen members of their family and closest friends were present. It's official: Magnus Carlsen is number one!